This is where the wild things are. 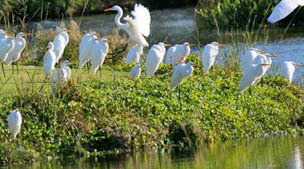 Blue herons, long-legged egrets, white ibis, and hooded mergansers make the marshes their home. The tidal creeks of Kiawah Island are brimming with red drum, spotted sea trout, and flounder. About half of the Island’s 10,000 acres are undeveloped natural lowlands, and of the high ground, half again has been donated for conservation, parks, or recreational uses. 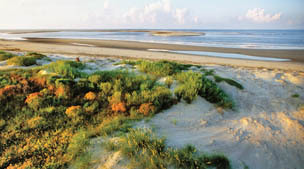 In addition, Kiawah Partners deeded between 300 and 400 acres of valuable dune land to the Kiawah Island Community Association to provide a permanent buffer to protect the beach and multiple dune rows for all to enjoy. Over its 40+ year development history, Kiawah Partners has donated back millions of dollars worth of land in the name of conservation. 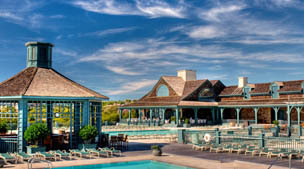 The Kiawah Island Natural Habitat Conservancy, a chartered non-profit, grassroots organization, was established by Island residents in 1997 to preserve the natural habitat of Kiawah Island. The Conservancy has preserved more than 20 properties and more than 320 acres of pristine barrier island habitat, including 150-acre Little Bear Island at the easternmost tip of Kiawah Island. Homes throughout the Island enjoy unobstructed views of bird-inhabited marshland, verdant forest, sun-sparkled water and rolling golf greens, thanks to Kiawah Partners’s careful planning and respect for the natural environment.